To walk into the TBT sanctuary is to find oneself at the spiritual heart of our community. Our stained glass windows within the sanctuary proper depict the six days of Creation, surrounding us by divine Inspiration for the creative work we do all week long. 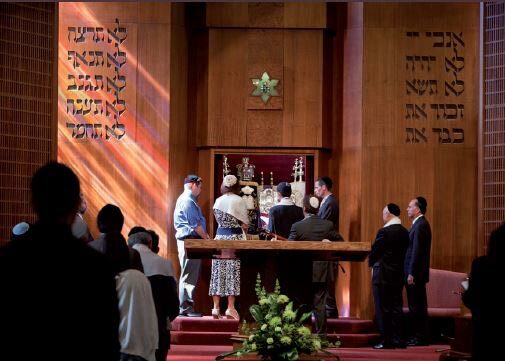 But they point toward the raised bimah, representative of Shabbat, the 7th Day, the time to cease and turn inward for spiritual elevation and renewal. Indeed our sanctuary is beloved for the sense of renewal and warmth it evokes in our members. It truly is a spiritual home to so many. We hope it will be for you, as well.